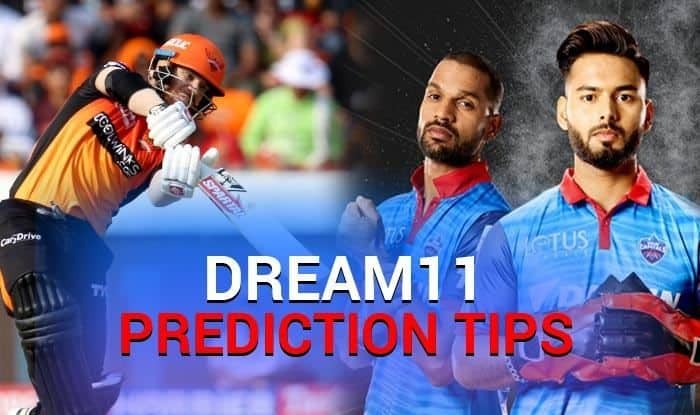 SRH vs DC Dream11 Team - Check My Dream11 Team, Best players list of today's match, Hyderabad vs Delhi Dream11 Team Player List, SRH Dream 11 Team Player List, DC Dream11 Team Player List, Dream11 Guru Tips, Online Cricket Tips IPL 2019. Dream XI Team SRH vs DC IPL 2019 – Cricket Predictions Tips For Todays IPL Match Hyderabad vs Delhi at Rajiv Gandhi International Stadium, Hyderabad: Kagiso Rabada (4/22) and Chris Morris (3/22) produced sensational spells of fast bowling as Delhi Capitals beat Sunrisers Hyderabad by 39 runs at the Rajiv Gandhi International Stadium, Hyderabad. Earlier, Khaleel Ahmed bowled a brilliant spell of fast bowling to return with figures of 3/30 as Sunrisers Hyderabad restrict Delhi Capitals for 155/7 in the match 30 of Indian Premier League (IPL) on Sunday. He will look to carry forward the momentum when they take on Sunrisers Hyderabad in their next Indian Premier League game at the Rajiv Gandhi International Stadium in Uppal on Sunday. While SRH will look to come back strongly after losing their last game to Punjab, DC will be riding high on confidence after being Kolkata at the Eden Gardens on Friday. TOSS – Sunrisers Hyderabad won the toss, opt to bowl vs Delhi Capitals in Hyderabad. Keeper – Rishabh Pant. He has been the one to look out for, even though Johny Bairstow has been splendid with the bat. Pant brings in the X-factor hence opting for him may be a better choice. Batsmen – David Warner (C), Kane Williamson, Shikhar Dhawan (VC), Shreyas Iyer, Prithvi Shaw. David Warner has been in ominous form and with Kane Williamson coming back in all probability one has to pick him, purely because of the quality he brings to the table. Dhawan has been in good touch in the IPL, he has just scored a match-winning 99* in his previous game, that makes him an obvious pick. Iyer and Shaw have also shown promise which forces you to pick them. All-Rounders – Vijay Shankar, Mohammad Nabi. The two allrounders have played pivotal roles for their team and that makes them obvious choices. Bowlers –Rashid Khan, Khaleel Ahmed, Kagiso Rabada. One cannot leave out Rashid Khan because of his stature in T20 cricket. Rabada and Khaleel Ahmed could be the other bowlers. David Warner, Jonny Bairstow (WK), Kane Williamson (C), Vijay Shankar, Manish Pandey, Yusuf Pathan, Rashid Khan, Bhuvneshwar Kumar, Shahbaz Nadeem, Khaleel Ahmed, Sandeep Sharma. Bench: Ricky Bhui, Deepak Hooda, Shreevats Goswami, Shakib Al Hasan, Basil Thampi, Billy Stanlake, T Natrajan, Wriddhiman Saha, Siddarth Kaul, Mohammad Nabi, Martin Guptill. Prithvi Shaw, Shikhar Dhawan, Shreyas Iyer (C), Rishabh Pant (WK), Colin Ingram, Chris Morris, Axar Patel, Rahul Tewatia, Trent Boult, Kagiso Rabada, Ishant Sharma. Bench: Rahul Tewatia, Colin Munro, Hanuma Vihari, Ankush Bains, Keemo Paul, Jalaj Saxena, Manjot Kalra, Sherfane Rutherford, Nathu Singh, Bandaru Ayyappa, Avesh Khan, Sandeep Lamicchane, Harshal Patel. Pitch: The pitch would assist spinners.